Over the next several months, we are going to start to explore various aspects of the end game. Whither Japan? Are they actually, as I think, a bug in search of a windshield? What does that mean for the world? How safe is the euro? Everyone over here seems to think Germany will bail out Greece. A breakup seems unthinkable to the people I've been talking to (so far). But what about Spain? Italy? Can you spell moral hazard? The Fed has said it will exit quantitative easing (QE) at the end of March. But what if mortgage rates rise? Where do we find $1 trillion (plus!!!) in US savings to fund the deficit, assuming foreigners buy about $400 billion? By definition, savings and foreign investment and the federal deficit must add up to zero. (We will go into that later - just take it as gospel for now.) How can we run 10% of GDP deficits if the Fed does not print money (as they did by buying Fannie and Freddie paper, which became treasuries, as I outlined last week)? That would require almost a 10% savings rate - with it all ending up in treasuries. How can that happen? Really? But before we get into that, a few housekeeping items. First, more than a few of you have written to say you are not getting the letter as usual. There are some problems when your distribution list is 1.5 million closest friends. We try to fix them, working with the various ISPs to stay "white-listed." It is actually a lot of work for Doug and my publisher. If for whatever reason your letter does not get into your inbox, just go to www.2000wave.com and find the letter there. And we are working on other mechanisms as well to insure you get this letter. And thanks for letting us know of problems. Rest assured, we do not randomly drop any of my closest friends from this list. Second, the invitations are starting to go out for our annual Strategic Investment Conference (co-sponsored by my partners Altegris Investments) which will be April 22-24 in La Jolla. In addition to David Rosenberg, Dr. Lacy Hunt, your humble analyst, Niall Ferguson, and George Friedman, my good friend Dr. Gary Shilling has agreed to come. There are several more rather exciting announcements I will be making in a few weeks. This conference will sell out. Unfortunately, for regulatory reasons, it is limited to accredited investors. If you have not already received an invitation, contact your Altegris Investments professional, drop a note to me, or register at www.accreditedinvestor.ws and you will get a call and an invitation. This year we are going to focus on "The End Game." I can guarantee you lively debate, fun times, and over-the-top wines - plus, you will be with people who are simply the coolest ever. The speakers are all friends who "get it." They called the crisis well in advance. These are the guys who sit and think every day about how this will all end up. The panels are going to be fun. Do not procrastinate. Register now. "But highly leveraged economies, particularly those in which continual rollover of short-term debt is sustained only by confidence in relatively illiquid underlying assets, seldom survive forever, particularly if leverage continues to grow unchecked." - Carmen M. Reinhart and Kenneth Rogoff from their new book, This Time is Different. I am reading (on my new Kindle as I travel through Europe) a very important book, which I will be referring to a lot in the future. Reinhart and Rogoff have catalogued over 250 financial crises in 66 countries over 800 years and then analyzed them for differences and similarities. This is a VERY sobering book. It does not augur well for the developed world to blithely exit from our woes. The book gives evidence to my adamant statement that we have a lot of pain to experience because of the bad choices we have made. This is the entire developed world, and the emerging world will suffer, too, as we go through it. It is not a matter of pain or no pain. There is no way to avoid it. It is simply a matter of when and over how long a period. In fact, Reinhart and Rogoff's research suggests that the longer we try to put off the pain, the worse the total pain will be. We have simply overleveraged ourselves, and the deleveraging process is not fun, whether on a personal or a country basis. "The lesson of history, then, is that even as institutions and policy makers improve, there will always be a temptation to stretch the limits. Just as an individual can go bankrupt no matter how rich she starts out, a financial system can collapse under the pressure of greed, politics, and profits no matter how well regulated it seems to be. Technology has changed, the height of humans has changed, and fashions have changed. "Yet the ability of governments and investors to delude themselves, giving rise to periodic bouts of euphoria that usually end in tears, seems to have remained a constant. No careful reader of Friedman and Schwartz will be surprised by this lesson about the ability of governments to mismanage financial markets, a key theme of their analysis. "As for financial markets, we have come full circle to the concept of financial fragility in economies with massive indebtedness. All too often, periods of heavy borrowing can take place in a bubble and last for a surprisingly long time. But highly leveraged economies, particularly those in which continual rollover of short-term debt is sustained only by confidence in relatively illiquid underlying assets, seldom survive forever, particularly if leverage continues to grow unchecked. "This time may seem different, but all too often a deeper look shows it is not. Encouragingly, history does point to warning signs that policy makers can look at to assess risk - if only they do not become too drunk with their credit bubble - fueled success and say, as their predecessors have for centuries, "This time is different." A small confession. I am in a London hotel, it is late on a Friday, and my mind is slowing down. So rather than ramble, I am going to hand you off to Van Hoisington and Dr. Lacy Hunt, two of the brightest economists I know (Lacy will be at my conference). The following is their latest quarterly letter. I have already read it five times. It is THAT important, and chock full of intriguing concepts. They also reference Reinhart and Rogoff, and offer up a very contrarian view about deflation. Open your minds, and let's jump in. The U.S. is facing a long and difficult road as it attempts to correct the over-indebtedness and wasteful expenditures of the past two decades. Both current and historical research help us to understand where we are in the continuing economic crisis, and to put it in perspective. The brilliant U.S. economist Irving Fisher first highlighted the fact that an economy's debt level could have a deleterious impact on economic growth if it is, in fact, excessive. 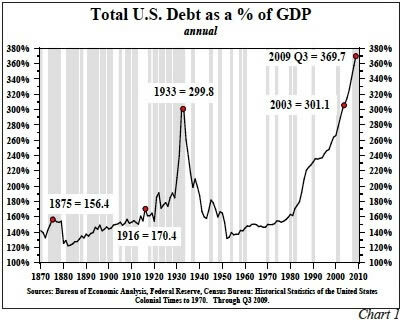 At $3.70 of debt for every dollar of GDP, U.S. debt is excessive (Chart 1). Fisher pointed out that the unwinding of debt levels results in prolonged economic distress, and we certainly agree. In 2009, the book This Time is Different - Eight Centuries of Financial Folly, by Reinhart and Rogoff, shed new light on the role of debt by compiling a database that looked at financial crises in 66 countries over a period of 800 years. The main standard in explaining more than 250 crises studied is whether debt is excessive relative to national income, even though idiosyncrasies apply in each case. They reiterate that this old rule (excessive debt) continues to apply, and this time is not different. We glean five important factors from this work that pertain to our present situation. First, financial imbalances occur when aggregate domestic debt is excessive relative to income, regardless of whether the government or private sector is accumulating the debt. Once debt becomes excessive, countries do not grow their way out of the problem; they must go through the time consuming and often painful processes of debt repayment and increased saving. Second, whether the domestic debt is externally or internally owed is not as critical as the excessiveness of the debt. Third, government actions, even involving sizeable sums of money, are far less helpful than they appear. As the book states, "Infusions of cash can make a government look like it is providing greater growth to its economy than it really is." Fourth, Reinhart and Rogoff cover countries in debt crisis with a host of different conditions, such as growth and age of population, political regimes, technology status, education, and other idiosyncratic features. Nevertheless, economic damage as a result of extreme over-leverage has remarkably similar results, whether the barometer of performance is economic output, the labor markets, or asset prices. Fifth, further increasing leverage to solve the problem only leads to greater systemic risk and general economic underperformance. The real question for financial participants is whether all these influences result in inflation or deflation, and the authors' research details both outcomes. As is widely feared here in the U.S., they outline that many countries have had the right circumstances and mechanisms to inflate away their debt overhang, and, in fact, have done so by debasing their currency. Those particular circumstances are not currently present in the United States. According to Reinhart and Rogoff the norm is that major economic contractions lead to deflation. Importantly, they call our present economic circumstances the "second great contraction." Thus, not only has the historical "qualitative" research on the subject of deflation chronicled the deflationary impulses emanating from overindebtedness (Fisher's 1933 "Debt-Deflation Theory of Great Depressions"), but also modern "quantitative" methods have now essentially confirmed this conclusion. 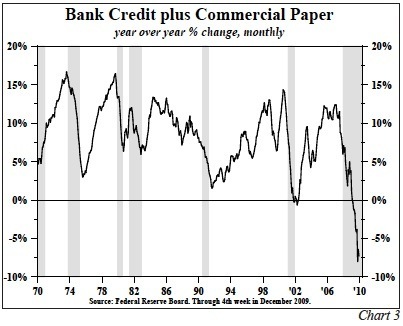 Over-indebtedness and major contractions lead to deflation. It has been more than a year since the Federal Reserve began a massive expansion of Federal Reserve Bank credit, from $1 trillion to $2.2 trillion, flooding the banking system with reserves. This unprecedented action naturally raised inflationary fears since it was assumed that this was the beginning of a monetary creation process which would eventually lead to job and income growth, excessive expenditures, and finally massive price increases. If the economy were not in the throes of writing down bad debts that were caused by a massive decline in asset prices, it is possible that the money supply (M2) in response to this increase in reserves could have expanded by $4 trillion, or 96%. According to the late Nobel prize winning economist Milton Friedman, an increase in M2 of that magnitude would have been highly inflationary. However, M2 did not explode. Instead, in the past twelve months this aggregate has risen only 3%. This is less than 1/2 of the average growth rate over the past fifty years (Chart 2). If, as Friedman assumed, the velocity of money is stable (MV=GDP) then nominal GDP expansion in the ensuing quarters can be expected to grow about 3%. If prices rise about 1.5%, then real GDP growth would also rise about 1.5%, which is far below the level of growth needed to employ new labor force entrants and existing unemployed or to more fully utilize our present unused capacity in our factories. In the last six months the growth rate of M2 has slowed to near zero. If this pattern continues, it would be rational to expect GDP to grind to zero with no change in the price level. The very first step toward an inflationary cycle has to be to get the monetary aggregates expanding vigorously. That cannot be accomplished with the Fed "printing money", i.e., adding more reserves into banks that cannot or will not make loans. The reason this process has not begun (and will not for a time) is the overhang of excessive indebtedness and asset price depreciations. No one needs to borrow, or has the resources or balance sheet to borrow, and banks are busily writing off bad debt. Irving Fisher warned of that process (note our Third Quarter 2009 quarterly letter). Despite the concurrent developments of little money growth and declining loan growth (Chart 3), the fear nevertheless remains that an inflation surprise might be just around the corner. The reason to discount this notion is that excessive debt has contributed greatly to a flat, or perfectly elastic aggregate supply curve. A country's inflation is determined by the interaction of aggregate supply and demand. 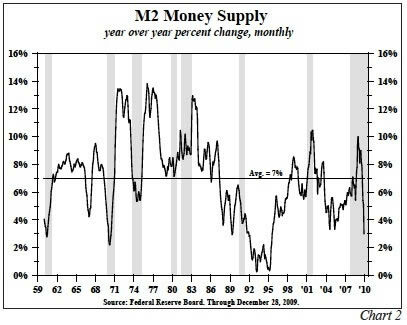 Friedman wrote that a large increase in money in the hands of the non-bank public would be inflationary because he assumed a normal upward sloping aggregate supply curve (Chart 4). 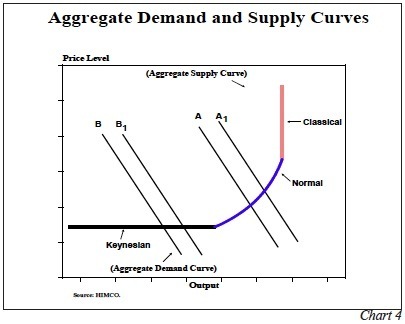 In this case the aggregate demand for goods (depicted as the demand curve Line A) would shift outward to Line A1, and thus prices would naturally rise. You will note what happens to prices if a demand curve B is intersecting the supply curve in the so-called Keynesian range where it is flat. If aggregate demand increases to B1, prices do not change. Whether the supply curve is in a flat, normal, or upward sloping position depends on the extent of excess resources in the economy. Today it is obvious that the U.S. economy has plentiful excess resources, so any increase in demand will result in little price change. This will be the case until our unemployment rate of over 17% (the U6 measure) drops by a considerable amount and we begin to use our factories well above our current 68% utilization rate. Thus, our current economic circumstances guarantee there will be no surprise inflation. Employing those who are out of work and fully utilizing our resources will be a slow process. More importantly, it will take time to get the monetary engine reignited. Banks will have to begin lending and people and companies will have to determine that prospects are good enough to take the risk for expansion and investment. It will take years for these processes to get started because of our over-indebtedness and falling asset prices. The consequences of excessive debt are already painful at the household level. 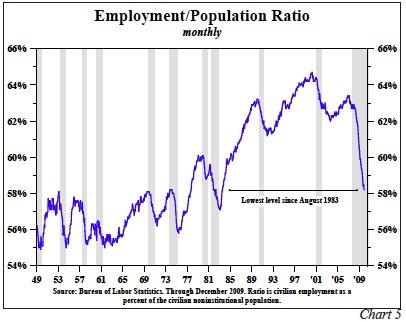 The civilian employment to population ratio, a highly important barometer of the average household's standard of living, fell to 58.2% in December, the lowest reading in 26 years and down from a peak of 64.7% in April of 2000 (Chart 5). Thus, the standard of living has worsened as the debt to GDP ratio has marched steadily higher. With debt to GDP still rising, a further deterioration of the standard of living is inescapable. Deficit spending only provides a transitory boost to the economy. It initially raises GDP, as it did in the second half of 2009, but then the effect dissipates and later is reversed, as financial resources available to the private sector are reduced. In a separate research study Rogoff and Reinhart write, "At the height of Japan's banking crisis in the 1990s, repaving the streets in Tokyo became a routine exercise. As a result, Japan's gross (government) debt-to-GDP ratio is now nearly 200% and a drag on what once was a vibrant economy." Our present high deficit situation suggests that taxes will rise (including those of state and local governments), depressing economic activity further. In addition to the expiration of the 2001 and 2003 tax cuts, the Obama administration is proposing substantial taxes on financial institutions to pay for the cost of the financial bailout. Since the tax multiplier is high, this will reinforce the drag on economic activity from the lagged effects of deficit spending. Since 1990 Treasury bond yields have steadily moved downward in line with a more benign inflationary environment (Chart 6). 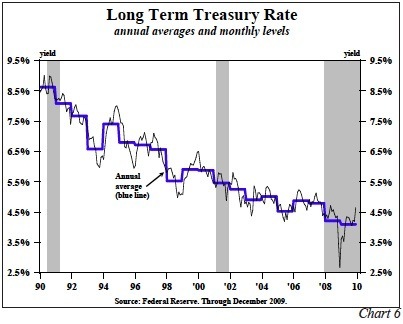 Those yearly declines in yields continued last year with an average interest rate of 4.07% versus 4.28% in 2008. Obvious sharp reversals have occurred in their downward trend due to shifts in psychology reacting to generally transitory factors, as we saw in 2009. To remain fully invested in long Treasuries in this high volatility environment requires a simple discipline based on the academic literature which demonstrates that over time bond yields move in the same direction as inflation (Fisher equation). Presently, we view the inflationary environment as benign because: 1) the U.S. economic system is overleveraged and academic research confirms that this circumstance leads to deflation; 2) monetary policy is, and will continue to be, ineffectual as efforts to spur growth are thwarted by declining asset prices, loan destruction, and adverse regulatory influences; 3) the federal government's spending spree will necessarily cause taxes and borrowings to rise, further stunting any economic growth. These factors ensure that inflation will be quiescent. Interest rates easily can and do rise for short periods, but remaining elevated in a disinflationary environment is contrary to the historical experience. We are owners and buyers of long U.S. Treasury debt. I get home next Thursday night and wake up to write the next Thoughts from the Frontline. I have to say that these trips really get me fired up, as I visit lots of clients and serious hedge-fund managers who challenge me to think. Plus, I get some time to ponder the big picture. I was asked a lot about what the vote in Massachusetts meant. My take, for what it's worth, is that it is part and parcel with the election of Obama in 2008. The voters in this country are increasingly getting scared. They may not mind that we will tax the golden goose a little more, they just want to make sure we do not kill the goose (Peggy Noonan's column). While they may not be sophisticated in economics, they understand intuitively that you can't run deficits at the current levels forever. That risks killing the goose. Obama was elected with a promise of change. McCain was seen as more of the same. The recent elections (Virginia, New Jersey, Massachusetts) were pointedly saying, this is not the change we had in mind. This is part of the equation that will give us the direction of the end game. How will the Democrats respond? Will we see the moderates wrest back control from the progressive wing? Blue dog Democrats allying with Republicans (the more things change...)? Can Republicans actually articulate a program and path to fiscal responsibility, or will they just sit on their hands, hoping the Democrats implode (a very bad idea!)? Stay tuned. Ok, it is time to hit the send button. Last week I was with my partners at Altegris for our annual planning meeting in the mountains of Santa Barbara. It was idyllic. Part of the meeting was about the conference, and I am telling you, this is going to be the best ever. Have a great week. I will be uber-busy, but there will be a lot of good times and great conversation. And I will be ready to get back home. Apparently, "Dr." Hunt is not so "bright," as he has neglected to mention that the debt/GDP chart (chart 1) includes contingent liabilities for the entitlements programs. In case you forgot, John, the US did not have entitlements prior to the depression. In fact, Medicare and Medicaid were passed in the mid-60s, so one cannot make a reasonable comparison of debt now versus the WW2 period. Contingent liabilities can be lowered by alering the benefits and/or fiscal policies. John, how about you start writing your own articles instead of reporting those of others as a way to market their books and newsletters; not that your articles would be any better, but still you need to end this masquerade. Oh and no one cares where you are or about your kindle. Spare us.